Kim Lauth wasn’t quite 3 years old when one Sunday night a group of missionaries made a presentation at her church, displaying photos of starving African children with sad eyes and bloated bellies. More than 50 years since that early heart-wrenching memory, Lauth (pronounced “Lawth”) now spends her days as an independent consultant for nonprofit agencies and recently became chief resource development officer at Positively Living, which assists people who are homeless, mentally ill, addicted to drugs and other substances, and living with HIV and AIDS. Her fundraising skills surfaced early. When she was a baby, the family moved from Knoxville to Illinois, where one day a direct appeal from the March of Dimes arrived in the mailbox with a cardboard sheet slotted for coins and a flyer with pictures of sick, premature babies in incubators. Lauth quickly convinced her mother to take her door-to-door to collect dimes to fill up the card. That was just the beginning. Later, she hosted a backyard carnival to raise funds for the local Ronald McDonald House, a tradition that lasted for several years. She also sold Girl Scout cookies and asked neighbors to donate to church missions. Originally wanting to earn a law degree – “I still would like to be a lawyer if I were to have a windfall of cash today,” she says – after high school Lauth took writing classes at a local community college and later studied nonprofit management through the Liberty University distance learning program. She was working as assistant manager at a McDonald’s franchise in the early 1990s when her husband, the store manager, encouraged her to apply for a job as a newspaper ad sales representative, where her gift of gab helped her be successful. A year later, a favorite cousin died from AIDS at a time when the epidemic was raging across the U.S. Compelled to do something, Lauth volunteered at the new local hospice, where she often sat with AIDS patients in their final days, holding their hands when no one else would. 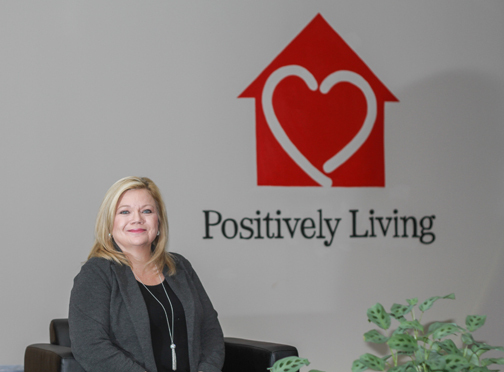 Kim Lauth, chief resource development officer at Positively Living, works to provide funding for the nonprofit program, which supports people living with HIV. Not an “overly maternal” person or hands-on caregiver – “I am not the person you call when you’re sick and I have a very weak stomach,” she admits – she considered the disease a social justice issue worth fighting for. Two years later, Lauth was offered a hospice job as volunteer coordinator, and it wasn’t long before she was raising money to fund the program, unaware that the experience would jump-start her nonprofit career. “It was just, ‘Let’s figure out how to do this and help people,’” she says. She then became executive director of OSF St. James Hospital Foundation Council, which was affiliated with the hospice program, and conducted a capital campaign to build a new facility in Pontiac, Illinois. 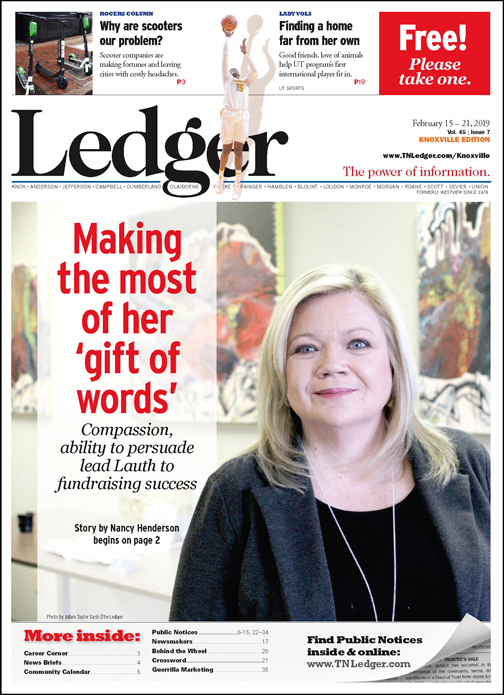 Finally realizing what she was destined to do – still, it wasn’t just about the fundraising, she says, but a way to influence strategic direction and policy – in 2002 she earned her Certified Fund Raising Executive designation. Homesick for Knoxville, where she’d visited relatives for many years, she and her husband, Kent, moved there in 2000. She worked for a while at the Alzheimer’s Foundation (now Alzheimer’s Tennessee) before taking positions at the YMCA of East Tennessee, CASA (Court Appointed Special Advocates) of East Tennessee, and the East Tennessee Veterans Memorial Association, where she raised money to build a series of granite monuments honoring 6,200 fallen veterans at World’s Fair Park. She often partners with Knoxville’s Alliance for Better Nonprofits, helping its members create their individual fundraising plans and leading group workshops on topics ranging from how to prepare a successful annual appeal letter to conducting a capital campaign. Lauth also offers videos and podcasts, and shares her expertise at various conferences. Positively Living provides a home for programs like “Project ACT,” which offers counseling, on-site HIV and hepatitis C testing kits, and awareness programs for the community. “Nonprofit organizations need to stop talking about what they need and focus on talking about the impact that they make because ultimately they don’t need to be begging for charity,” she points out. Jerry Askew, president of the Alliance for Better Nonprofits, met Lauth about 20 years ago when he served on the YMCA board of directors and she was development director. The two worked together to build a fundraising strategy for the Y. Past president of both the Smoky Mountain Planned Giving Council and the Great Smoky Mountain Chapter of the Association of Fundraising Professionals, Lauth now serves on the boards of the Knoxville History Project and Zaevion Dobson Memorial Foundation, which provides recreational and educational facilities for underserved communities. She also sits on the advisory board for the Junior League of Knoxville and in June finished a two-year term on the national League of Women Voters, based in Washington, D.C., where she also chaired the organization’s fundraising efforts. Lauth and her spouse are avid 1980s music fans who have seen 28 bands, from Cheap Trick and Def Leppard to Culture Club and Elton John, perform in the last three years. (They already have tickets to an upcoming Paul McCartney concert.) She is writing a book about fundraising and hopes to “get a little more serious” about playing drums this year. In October, a lifelong profession of helping others came full circle when she joined Positively Living, best known as Knoxville’s primary HIV and AIDS service organization. She still consults with, speaks to and trains nonprofit clients, although not quite as much, while leading Positively Living’s fundraising efforts, government relations and marketing. Looking back, Lauth is grateful she didn’t “peak” in high school. “I’m always constantly reinventing myself,” she says. “One of the blessings of getting older is that I just have become really pretty fearless. There was a time when I wouldn’t have been comfortable putting myself out there for a national board or trying to do a podcast or recording myself on video or taking on a challenge like working with Positively Living and still doing consulting.